The cycle of generations in the US shows us the patterns of history. And those patterns predict that the crisis we are in will not be over until around 2025. One of the most significant aspects of generational research for me is its predictive ability. The cycle of generations described by Neil Howe and William Strauss in their books (starting with “Generations“) has an amazing predictive ability. Their book “The Fourth Turning“, written in 1997, predicts many of the events we have seen in the last few years with amazing accuracy. But this is not astrology or soothsaying. The predictions are based in strong social science that shows how the character of generations creates specific changes in society. Information about turnings can also be found on the Lifecourse Website. Howe and Strauss point out that there are four cycles in history, that they call “turnings”, which are very similar to the four seasons of the year. It begins with the “High”, similar to Spring, a period in which life is growing, the days are getting longer and optimism abounds. The last High in the US was between 1946 and 1964. The next turning is the “Awakening” which is like the Summer, a period where life flourishes in many forms, perhaps to the point that things are a bit out of control. Our last Awakening the Consciousness Revolution from 1995-1985 when everything our society was based on during the High was questioned. The third turning is the “Unraveling”, similar to the Fall, when life dies back, the days shorten and things feel chaotic and uncontrolled. The last Unraveling in the US were the Culture Wars from 1986-2005, when society fell apart as it answered the questions from the Consciousness Revolution. 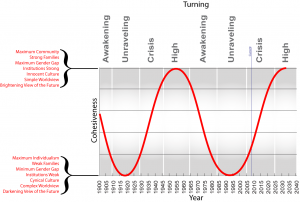 The fourth turning is the “Crisis” which is most like Winter. During the Crisis the seeds that have been planted in the fall must survive through the short, cold days and life is bleak and unforgiving. We are in the Crisis now, and it will likely last until 2025. Those that survive the Crisis will enjoy warmth and promise of the coming Spring/High. 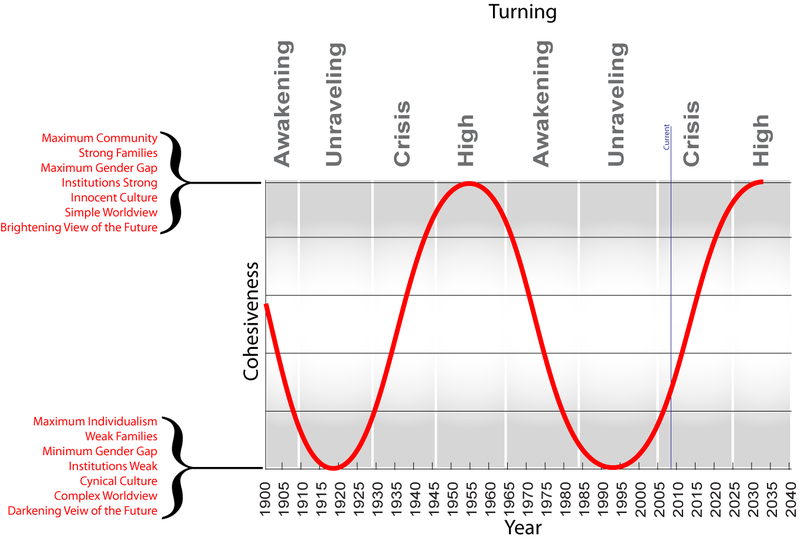 The chart above shows the turnings since 1900 (click on the image to enlarge). The red line represents the “High” and “Low” of the cycle. At the top of the curve, there is maximum unity in society as well as a simple worldview. At the bottom there is maximum discord and a complex worldview. Just like the cycles of the seasons, the turning are of a specific length. Most vary from 20-25 years in duration. Just like the seasons in nature, it is difficult to change the timing of the turnings because they are guided by a natural force. The natural force in play is the length of an average long human lifetime, 85 – 100 years (also known as a saeculum). This period is significant because it is the amount of time required for us to forget the lessons of previous generational cycles. The cycle makes a full revolution from the High through the Crisis (and then repeats). So while it is possible financial crisis we are in will end soon, perhaps in the next few years, the larger crisis will last for at least 10-15 years (until 2025 or perhaps as early as 2020). Think back to our most recent historical example, the Crisis turning from 1929-1945. It began with the Great Depression. By the time that the Depression was “over” (in the late 1930’s) Europe was already marching toward WWII. Think of what the outlook must have seemed like in the late 1930’s. If you had managed to survive the Depression you were wary and protective. Although the economy was improving, there were much bigger storm clouds gathering on the horizon. And by 1939 it was clear that the Great Depression was nothing in comparison to what was coming in the War. The world looked very bleak indeed (just like the middle of winter), and few would have predicted the glory that was in store in 1945. We are in a similar period now, and we are building towards that climax which is still 10-15 years away. I see this coming war taking one of two shapes. It will either be a war against Global Warming/Peak Oil/Water Shortage and other threats to our living environment, or it will be a battle against another nation or group of nations (Arab or Chinese being most likely). I would prefer the former, but as a Generation X’er I have little influence. Fortunately, there is one person in my generation does have some influence on this direction, and his name is Barack Obama (no guarantee that he will have the answer either). The good news is that society will pull together during this crisis and we will forge a new direction for our entire country (and perhaps world) before it is over. That is how the next High will arise, but it will be a long time before it arrives. Although our situation may seem dire, it will be useful to be aware of the fundamental changes happening in our society as we face this immense struggle. And, as I have said many times, it will require a huge effort from all the living generations who must work together despite their different views. If you want a primer on the research of William Strauss and Neil Howe, see my “start here” section.